I recently went backpacking in the Uinta Mountains. It’s a range of gorgeous peaks close to my home in Park City, Utah. A group of friends planned to spend a few days in the backcountry, so we got together to discuss everything we’d need for the trip. We had a lot of experience hiking and camping in this area, and we talked about a lot of things. But one subject never came up: bears. Bears do exist in the Uintas, and we know it, but they’re rare. I’ve taken other trips, to the Teton Range and to Yellowstone, and plans always included the possibility of bears because they’re more common there. On this particular trip, however, we didn’t think about it. We started the 11-mile hike into our campsite, and about four miles in, we came upon a park ranger riding a horse and towing a pack mule called Erma (the ranger called her Erm). We stopped to chat about the weather, and our friendly ranger mentioned offhandedly that someone had seen a bear a few days earlier. She didn’t mention the exact location, where the bear was headed or give us any kind of warning. She was just a ranger who happened to mention a bear during a conversation. What happened next was interesting to watch. Again, only one person had seen a bear in the area, and it’s an enormous area. But based on a single observation, we started behaving differently. Over the next two days, we did things we hadn’t planned on during our trip prep. We hung our food in the trees and took other precautions to avoid attracting bears to our campsite. To be clear, these things were all good ideas, but the point is we had not planned on doing them. All it took was a single comment, based on a secondhand report, to change our behavior. On the hike out, I thought about our response. It was based on a single report, a sample size of exactly one. 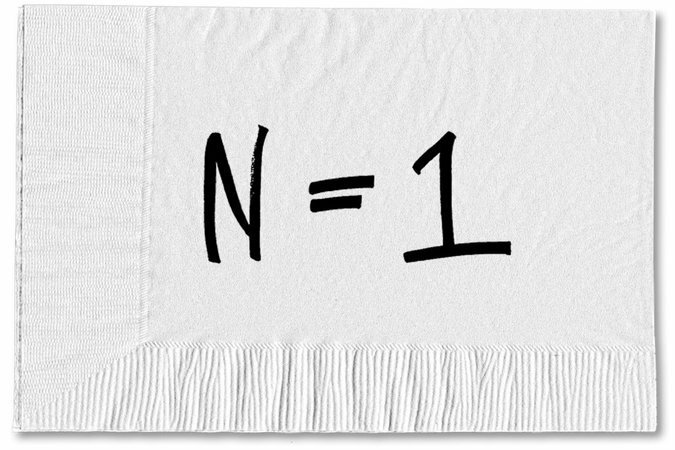 In statistics, the shorthand for the sample size of an experiment is often denoted by using the letter “N.” It equals the number of observations in the sample, and having an N of one is more closely related to a personal story or anecdote than to a valid experiment. In other words, it’s rarely a good idea to make a decision when N equals one. Yet, we do it all the time with our money. We’ll start by doing the right thing and picking the investment options in our retirement plan at work based on what we think will give us the best shot at meeting our goals down the road. And we’re happy with our choices, until we hear on the news that the economy is slowing down. Or we talk to a co-worker who can’t believe we’re still invested in the international fund or ignoring the new real estate offering. Whatever the catalyst, we latch on to one observation and let it send us into a tailspin. It’s very easy to forget that it’s just a single observation. In most cases, it’s just someone else’s opinion or guess. It’s so important to expand our sample size before making big money decisions. A single event, weighed in the context of everything else that’s happening, does not predict the future. But in the heat of the moment, it can feel like everything hinges on this one thing. If we genuinely feel like a single sample is of some consequence, then it shouldn’t be that difficult to get confirmation of our conclusion from other samples. These single observations can stick around in our thoughts for a long time, even though we know better. I know, for example, that the next time I go into the Uintas, bears will come up during trip prep. In fact, I still latch on to a single sample that happened years ago when I rode my motorcycle down a canyon near my home. I’ve driven this particular route hundreds of times, and one time (one time! ), a deer ran out in front of me. Now, every time, in that same place, I think, “O.K., watch out for a deer.” There’s nothing special about that particular spot in the road. A deer could just as easily pop out somewhere else, but I now assume that’s where a deer will appear. There will be times when a single observation will remind us of something we should be doing anyway. I don’t regret being cautious about bears or being careful when I’m riding my motorcycle. But we also need to understand how an N of one may not always mean what we think it means. 0 responses on "Featured Blog: Resist Changing Direction Because of a Single Event"